By Barry Cook. Part 4 of a 6 part series. Read Part 1 titled Personality-Based Winning first, then Part 2 Learning is a Cycle. Part 3 is Learning Driven. An expected win or a surprise defeat can produce over-confidence or insecurities within the athlete or team. How does that happen and how do we ensure that our interpretation as coaches, of what happened are facts and are based on reality? Understanding the process that can lead to either of these behaviours can give some insights into how we jump to conclusions and then consider how we can as coaches help athletes decipher the information that they are receiving. We all react to what we see and hear in our own unique way. Two witnesses to the same event see it differently. Ask five people following a football match, “what was the game like?” and you will get five differing versions. Why and how does this happen and what are the implications of this for coaches? The human brain cannot process all of the information that it’s getting at any one time. It’s far too much. So we select some of the data that is important to us and ignore the rest. We select that information on previous experiences, which is different for everyone. We all react to what we see and hear in our own unique way choose at that moment in time that is important to us. See how you perceive the picture below. 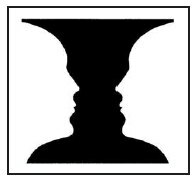 Do you see a vase or do you see two faces? 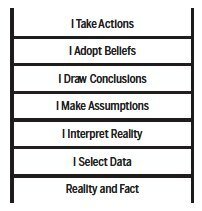 Argyris further developed his ideas to look at the process of how we interpret and draw conclusions from the information we select and in the 1970s developed a model called the “ladder of inference’: This describes the thinking process that we go through, usually without realising it, to get from a fact to a decision or action. 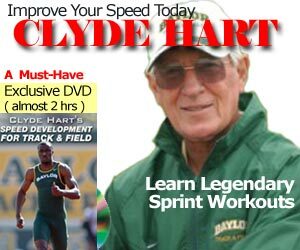 Imagine an athlete competes in a race. We then debrief them in what they think happened. They begin with something that happens that is based in reality and fact —the kind that would be captured by a video camera. They then select some of that data. To this selected data they add meaning to it by taking that experience and putting their interpretation on what has happened and develop assumptions about what they see, hear and feel. They then draw conclusions from the information they have now collated and reinforce these conclusions with their beliefs that have developed over their lifetime. This will form the basis of their actions (which in this case is what happened) based on their beliefs. A level-4 hurdles coach recounted a story of an athlete that took part in an indoor hurdles race at Lee Valley athletics centre. The athlete was expected to win but was beaten into second place albeit with the same time as the winner. The athlete’s perception was that it was a terrible race and then recounted everything he had done wrong. The reality was, as the coach pointed out, his second fastest time ever over the distance while the winner pulled a PB out of the bag that was far superior to his previous mark and could not have been expected. Things that happen like this are out of the control of that coach’s athlete. Your view of what you saw may be completely different from the perception of the athlete and your role as a coach is to get to the reality of what happened. We may well be planning the next stage of their training based on this view. There is no time-scale for going from bottom rung to top rung. It could be in seconds. It may happen over a much longer period of time. The athlete may feel that they have not competed well or they may feel they have performed beyond what they expected. They may not have seen something that is crucial to the outcome or they may not have selected that particular piece of information. Are my observations and actions taken based on facts or are they the facts as I see them? Have I ascended the ladder of inference or am I still based in fact and reality? Do I tend to jump to certain rungs? Do I tend to select only part of the data? Did I see a vase or two faces? 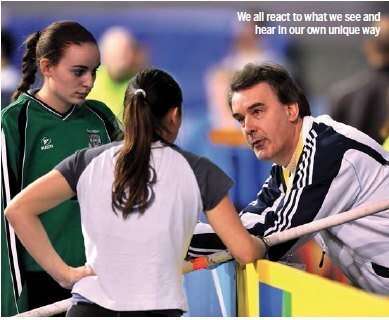 In a future article I will discuss a communication model that can help communicating reality with our athletes.